Blackwell’s Broad Street is delighted to host Costa Award-winning author Frances Hardinge for a unique event to celebrate the paperback publication of A Skinful of Shadows – the haunting and atmospheric story of a young girl’s quest to shape her own destiny. Sometimes, when a person dies, their spirit goes looking for somewhere to hide. Some people have space within them, perfect for hiding. Twelve-year-old Makepeace has learned to defend herself from the ghosts, which try to possess her in the night, desperate for refuge, but one day a dreadful event causes her to drop her guard. And now there’s a spirit inside her. The spirit is wild, brutish and strong, and it may be her only defence when she is sent to live with her father’s rich and powerful family. There is talk of civil war, and they are going to need her to protect their dark and terrible family secret. But as she plans her escape and heads out into a country torn apart by war, Makepeace must decide which is worse: possession – or death. Frances Hardinge reads from A Face Like Glass. 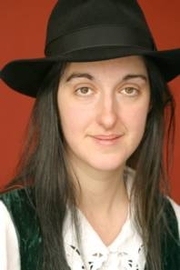 Frances Hardinge is currently considered a "single author." If one or more works are by a distinct, homonymous authors, go ahead and split the author. Frances Hardinge is composed of 3 names. You can examine and separate out names.